This week, the knots at the tops of these braids looked like little faces, so I went with it. 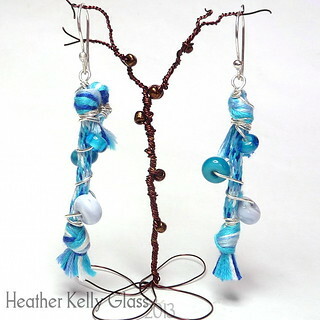 I made kumihimo braids in shades of blue and wire-wrapped them in sterling silver with some of my blue lampwork glass beads. I twisted and bound the top tassels to be like hair. I’ve collected a nice pile of different colours of embroidery threads to use for my kumihimo. Here’s a pair of earrings I did in oranges, pink, peach and ochre. The kumihimo is a flat braid chevron pattern – I had some difficulties with the tension in this braid, had to go in and tighten it up some more and then found I had tightened it too much in places… I work without weights on the threads and I suspect this braid would have been easier with them. I wire-wrapped the tops of the braids in copper and knotted the tassels at the bottom, some with frosted seed beads on them. It is incredibly hot in London at the moment, making me utterly useless. Last week’s earrings are pretty simple as a result! 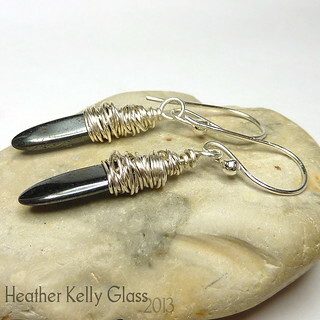 Shiny black hematite daggers, wire-wrapped in sterling silver and with sterling earwires. 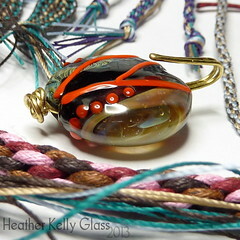 Some spiral kumihimo loops with lampwork beads on them this week. 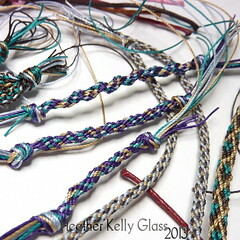 The kumihimo spiral braids are in purple, teal green, gold and baby blue. These are the ones with the looser spiral – if you make them the other way you get a tighter spiral. I added a pair of big hole beads in dark turquoise I made previously. 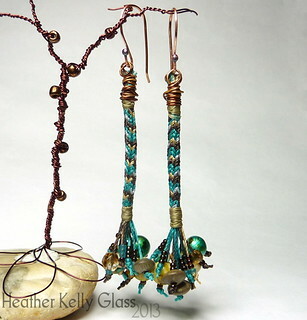 (I also had some in Lauscha turquoise which doesn’t have the grey sheen, but they were a little too bright, I thought). 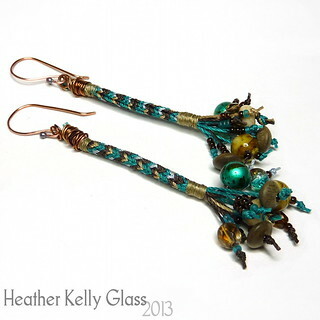 Copper earwires. 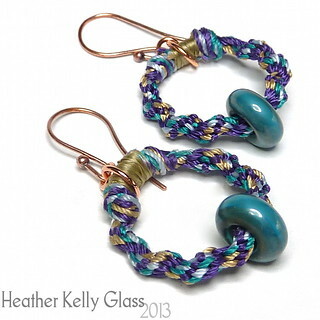 And here are the next pair of kumihimo earrings! 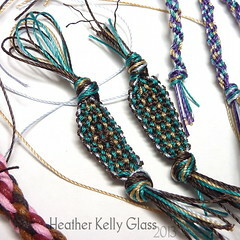 These are the octagonal braid and I put all sorts of beads on the tassel ends. 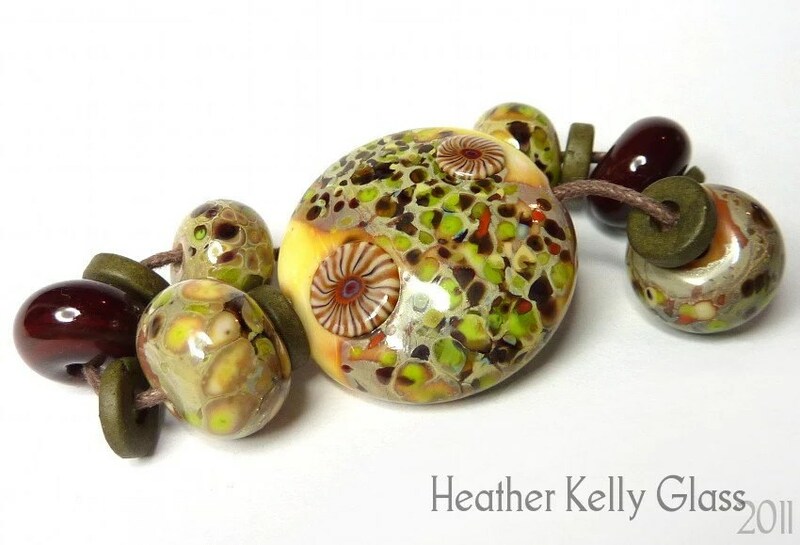 There’s a little lampwork spacer hiding in there on each earring, along with Czech crystal, wooden rondelles, acrylic beads, crackled crystal and little seed beads in teal and brown. These are long but still comparatively light. 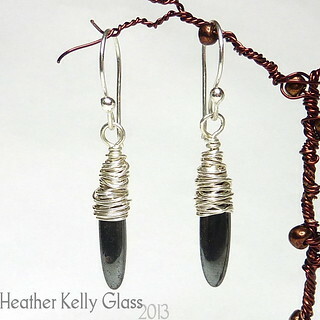 The tops are wire-wrapped in the end of my flame patinated copper. Before I show this week’s pair of earrings, I wanted to get this post written. I took a few pictures the other week to show all my braids-in-progress. All the braids! 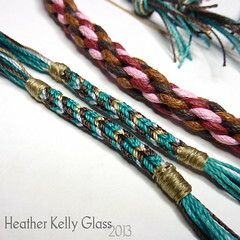 The large brown and pink braid was my first one, in 1.5mm cotton cord – I then started using C-lon/S-lon for the others. After the thin blue and brown braid, I decided I don’t like 8-strand braids in the thinner threads, so everything after that has had more strands. These are a pair of octagonal braids. It took me a while to get the hang of these because you have to alternate rotating clockwise and counter-clockwise and it’s very obvious when you forget and go the wrong way! But I worked out that if you think of it as switching between positions 24 and 32 instead, it’s much easier because you can always see where to go instead of having to remember what you just did. 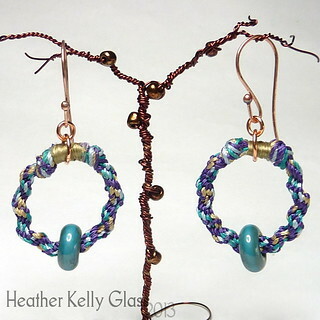 These are my flat braids that I’ve already made into earrings. These purple spiral braids are interesting, because if you switch the left threads down instead of the right, you get a looser spiral that I prefer in some ways. I have two going one way and one shorter one the other way in the photo. In the right corner you can see the aforementioned thin blue and brown braid, and there’s also a bracelet-length piece of the teal/brown/gold braid I’ve used in previous earrings. I made my centre weight from a fugly bead and some brass wire. I can hook it into the knot at the end of my threads. I got a whole load of embroidery thread off eBay, so I have many more colours to play with now!